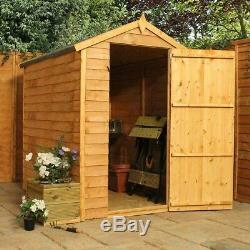 This Overlap shed range offers a great value storage space for your garden. The shed has a high roofline and a quality build setting itself apart from competition. This garden building is supplied with styrene glazed windows, which are 100% shatterproof and a safer alternative to glass. 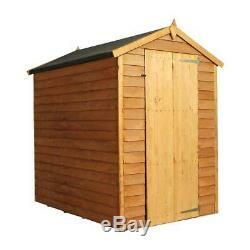 The rigid frame and high quality rustic overlap board makes the shed strong and sturdy. These quality sheds have strong ledged single door with the roof and floor constructed of solid sheet materials giving the shed a durable structure. The apex roof is shielded from wood rot or fungal decay by the supplied mineral roofing felt. This garden building is pre-treated with a water based timber treatment for protection during transit. In order to receive the full 10 year anti-rot guarantee, it is necessary that you treat the shed with a high quality, spirit-based, timber preservative prior to or shortly after construction. See Terms and Conditions for further information. Supplied with felt, fixings, and full instructions for DIY self-assembly. 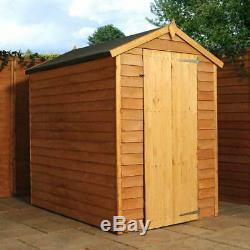 Windowless Garden Buildings offer added security by concealing your garden equipment from prying eyes. The garden building is supplied with FREE mineral roofing felt and galvanised clout nails. 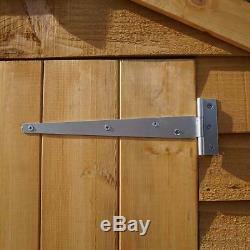 To add strength the garden building has Ledge door that also allows for a staple and hasp to be fitted to secure your shed. For added strength and stability the garden building features double framed corners. The Garden Sheds internal framing is planed and rounded making it resistant to moisture and helps avoid splinters to hands. 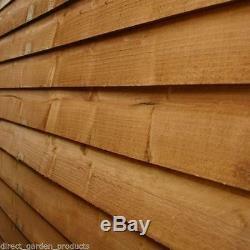 To provide a sturdy support on your shed base this garden building comes with planed timber floor joists. We advise the use of a pressure treated portabase with this product to increase its longevity. See our imformation page for alternative bases. 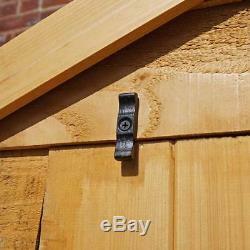 This garden building is supplied with a Butterfly catch to keep the door shut tight. Staple and pin available as an optional extra. Solid Sheet Roof and Floor. This garden building has traditional overlap cladding with a rough sawn surface that makes the panel very absorbent which helps when apply a wood preserve. 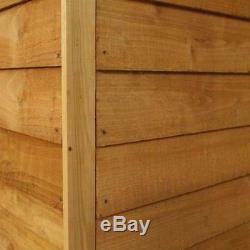 Hardwearing, stable, excellent moisture resistance and less prone to warping and layer separation than ply. 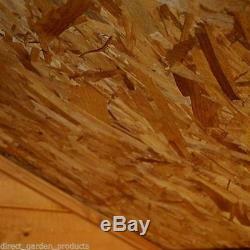 Even surface without knots and doesn't split when nailed or screwed. 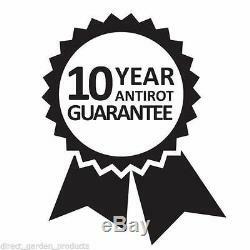 This Product carries the 10year Anti Rot guarantee as long as the garden building is well maintained. 0.28 Solid Sheet Board. Surcharges apply to postcodes BT, TR, PL, TQ, KW, PA 20-38, IV 40-48, AB, PH 22-26, PH 30-41, PH 50, KA, Eire, IOW and IOM. Product is supplied flat packed complete with comprehensive instructions for self-assembly. Assembly is available as an optional extra. 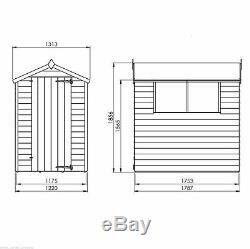 The item "6x4 GARDEN SHED SINGLE DOOR APEX WINDOWLESS WOODEN SHEDS 6ft x 4ft New Un Used" is in sale since Tuesday, January 30, 2018. 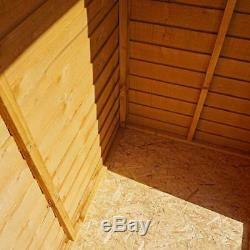 This item is in the category "Garden & Patio\Garden Structures & Shade\Garden Sheds". 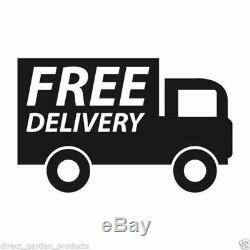 The seller is "directgardenbuildings" and is located in National. Windows: 2 Fixed - Can be placed on the left or right.